The 1960s and 1970s are the poster child of inflation gone awry. Government spending during this time period grew at an above average historical rate, on average 10.6% per year during the decade of 1970. Why did inflation become such a problem in this period? The Treasury-Federal Reserve Accord of 1951 freed the Federal Reserve from Treasury control of interest rate levels; however, it retained a co-equal responsibility for management of the National Debt between the two. In fulfilling its debt management responsibility, pressure mounted on the Fed in the early 1960s to make sure the Treasury always received a successful auction at the lowest interest rate possible. During this time, an “even-keel” auction policy began to be followed by the Fed. Based on its debt-management mandate, the Fed would buy securities prior to an auction in order to drive down rates and increase available reserves in the banking system to “accommodate” additional government financing. The auction would be held, and the success of the auction would be determined by how well the rate held up in the market after the debt was absorbed in the market. The objective was to make sure the market was on an “even keel” during and after the financing round. This put the Fed increasingly in a political position in which it became unwilling to remove excess reserves once the Treasury issuance was completed. The inability to control the level of reserves in the system as the government borrowed more and more money led to increasingly high levels of inflation during the 1960s. Inflation became an even greater issue when President Nixon entered office in the late 1960s. During this time the academic idea known as the Phillips Curve infiltrated Nixon’s administration. The economic concept holds that a trade-off over time exists between unemployment and inflation. The assumption that began to underlie Fed policy at the time was that the government could pursue a policy of trading higher inflation for lower unemployment. 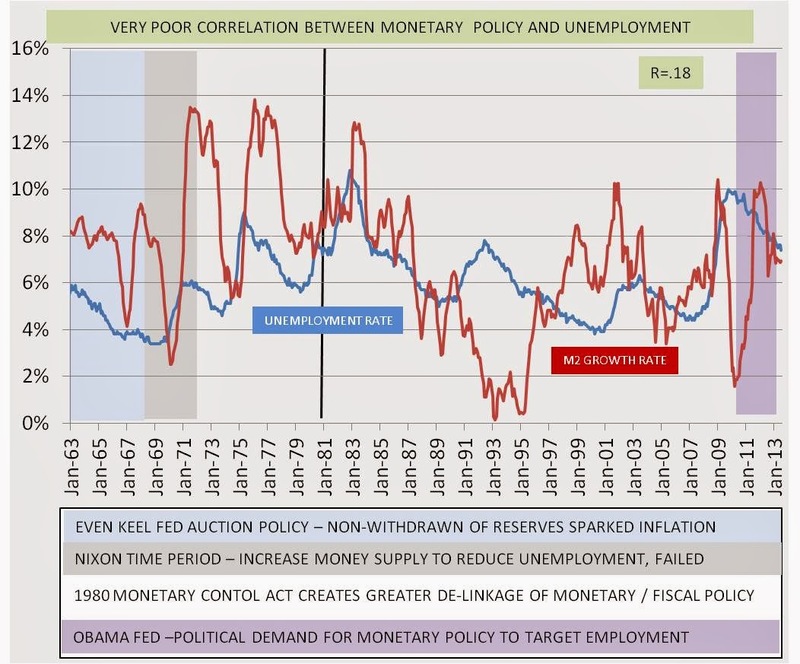 This led to pressure on the Fed to coordinate policy and increase money supply growth when unemployment was above the politically acceptable target at the time of 4.5%. The Nixon approach was an utter failure. In 1972 not only did unemployment not fall as shown in the graph above, it increased from 4% to 6%. 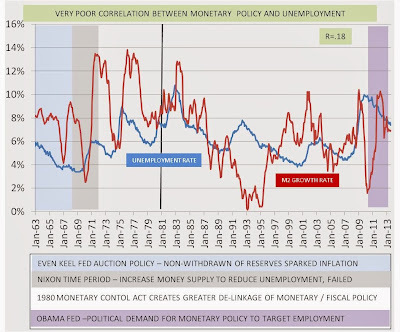 In retrospect, empirical data is lacking to prove a correlation exists between the change in growth rate of the U.S. money supply and the change in unemployment rate. The correlation is only .18 when data from 1962 thru mid-2013 is analyzed. The low correlation is a very important point for investors. The Federal Reserve is the regulator of the U.S. money supply, not the employment watchdog. 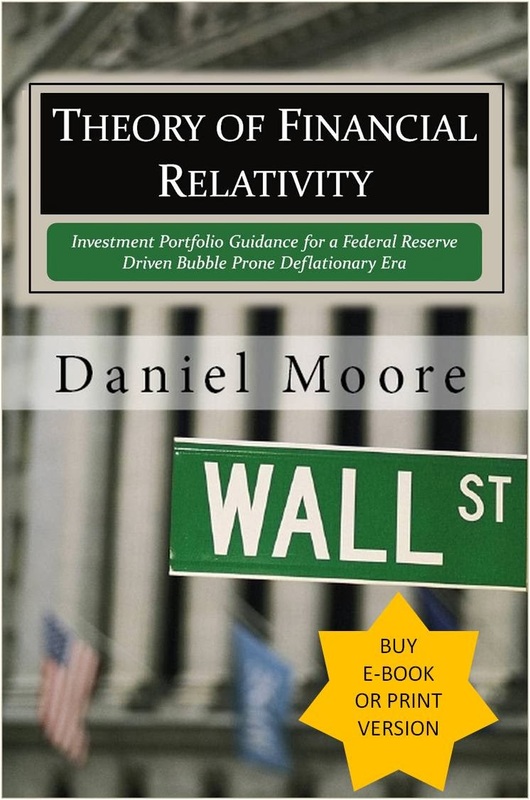 In its supreme position in the U.S. financial system, the Fed can impact the cost of money charged by the market on government debt, and thereby greatly influence the downstream rates and valuation of financial market instruments; and, more importantly it can change the level of the country’s money supply outstanding, and it does so by changing the level of reserves in the country’s banking system by buying and selling government debt. The evidence shows, however, that the Fed cannot change people’s desire to work, or someone’s need to hire someone to do work by changing the money supply growth rate through quantitative easing. 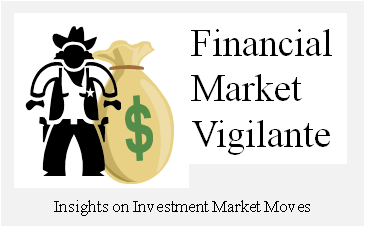 These are societal issues that are most closely aligned with government fiscal policy. Faults in the country’s fiscal policy through the ages with respect to the regulatory environment and incentives to work much more closely correlate with the country’s employment health. Combine an over-reaching government that was incapable of controlling spending programs with a correspondingly lenient Fed policy, and the result was inflation fireworks in the 1970s.